With Ratty, it was boats, but I have a strong belief in the power of messing about with words. Children are hard wired to enjoy nonsense, and playing with language is something they take to immediately. From early peek-a-boo and finger rhymes, through nursery rhymes, poems and songs, we are exposing our kids to new vocabulary and the rhythms of language, as well as reinforcing the sheer pleasure of messing about with words. By focusing on letters, building words, listening to the sounds that join together to make a recognizable or a nonsense word, predicting, rhyming, and manipulating letters to create new words, we are helping our children learn to spell, read and write. Here are some activities we can use to encourage kids to play with language, develop their literacy skills, and have fun. All can be used by a parent, or adapted for the classroom. Not really a formal game, What’s Missing is when a parent or teacher leaves out a word and asks children to identify it. It might be during an often-read story or nursery rhyme: “Humpty Dumpty had a great ...” Children will join in enthusiastically to provide the missing word. It’s also great fun when Dad substitutes one word in a story: “So the three bears went off for a walk in the marshmallow.” Giggles and groans of "No Dad!" will greet that one. Encouraging your kids to play with rhyme is really beneficial to both their reading and spelling. By working out that "stink" rhymes with "sink" they are also unconsciously absorbing that chunk:ink, making it easier for them to decode "pink" and to spell "think". Combine What's Missing and Rhyming Time so children have the fun of providing a rhyme. This can start in read alouds, where you first let your voice slightly emphasise the rhyming pairs, and even slow right down on the rhyming word. Next read-through, leave a little gap and make your voice go up just before the rhyming word, so that kids can jump in to supply it. "Hickory Dickory Dock, The mouse ran up the ...?" This works well with rhyming poetry like nursery rhymes, songs and finger rhymes. Jokes and riddles appeal to most kids and are also ways to have fun with literacy. Readers who aren’t ready for a short novel might be less daunted by a book of short jokes, so keep an eye open for these at your local library or second-hand shops. It’s a magical moment when children begin to understand jokes and riddles – their eyes light up, they giggle or guffaw, and usually spend the next few days (or weeks!) sharing that same joke with everyone they meet. Supplying books of jokes at this strategic moment is a perfect way to segue into other books, and to borrowing from the library. What does a 300 pound budgie say? "Polly want a cracker, NOW!" Word Magnets is an activity where kids can practise using words with short and long medial vowels in sentences, by dragging them into position. In Word Blocks, they make as many words as they can from letter blocks. Knoword More for 12+, Knoword is lots of fun. You are given a random word's definition and starting letter. Type in the rest of the word with correct spelling to advance in the game. There's a time limit too, and you can play without registering, but register to keep track of scores etc. Save the Words Perfect for older kids, this website encourages us to adopt a word, perhaps one on the brink of extinction. Scrolling allows you to hone in on other words, clicking shows you the definition. Read more about it in my post. What's the Word? This word game can be played online but it's also an app for iPod. Similar to hangman, but no hanging, you only have five guesses before you lose. Scribble gives you 10 random letters, then you must make as many words as possible, using pencil and paper. Lowtech but fun. Wordslide Get random letters which you must slide together to generate words within a time limit. Click "visit" and "play online" to try it. Wordmaster Test your vocabulary skills by finding the missing word in a sentence. Guess letters "hangman" style. Wordle Another Book Chook favourite, Wordle enables us to generate word clouds from any text we paste in. Guess the Wordle Find different synonym puzzles each day for different aged kids. Hover your mouse over the wordle to see if you have the correct answer. eg First Grade puzzle might be "chum, buddy, sidekick" = friend. School Time Games there are lots of word games on this web site’s Language Arts page. The Book Chook, of course, likes Fowl Words and Chicktionary. Syllables Factory is a BBC game that helps kids revise how to break up words into syllables (chunks of sound). This is such an important skill for kids to learn. It helps them to decode words by identifying the syllables or chunks, and helps their spelling too. Fit Brains You need to register for Fit Brains, but many games are free. Some of the word-based games are: Wild Word Garden, Word Power, Street of Dreams, Paradise Island. Spelling City has some vocabulary games like Unscramble and Hangmouse. I haven't mentioned Scrabble or Scrabble-inspired games like Lexulous because strangely, I am not a fan. Millions of other people in the world are though, and here is a link to a Make Use Of.com article about some. I describe and store some of my favourite real life games under the Book Chook Bag of Tricks tab. You'll also find articles about word games on The Book Chook by using the label, word games. Recently, I invented a word game based on Only Connect in this post. We've all played the game where you have a long word and try to make shorter words from its letters. Here's a variation. Choose some long words, type them up in large font, print them out on card, cut them up into letters and put the letters from one word into each ziploc bag. Keep a master list, number them, and put one number on that word's bag, so you can check at the end if the kids manage to get the actual word. The idea is to use the letters in the bag to make as many words as possible. Get your kids to record the words they make and then they can reuse those letters to make another word. Assigning points is fun if kids are competitive - the easiest scoring system is one point for one letter words, five points for five letter words and so on. This is a great game for those times when you're waiting at the doctor's, or for travelling. LitLad is a great blog with a feature called Word of the Week. Every Sunday the boys and I read a book from which they pick their favorite-sounding unfamiliar word. They each write the word that night and we try to use it in conversation as much as we can throughout the week. Adopting a habit like this is such a simple and effective idea to focus the whole family on acquiring new vocabulary. If you love discovering obsolete words, try Holly's other blog at Mother is Not Concerned. Having magnetic letters and words on the fridge encourages kids and adults to leave messages for each other, make words, and even create short poems. 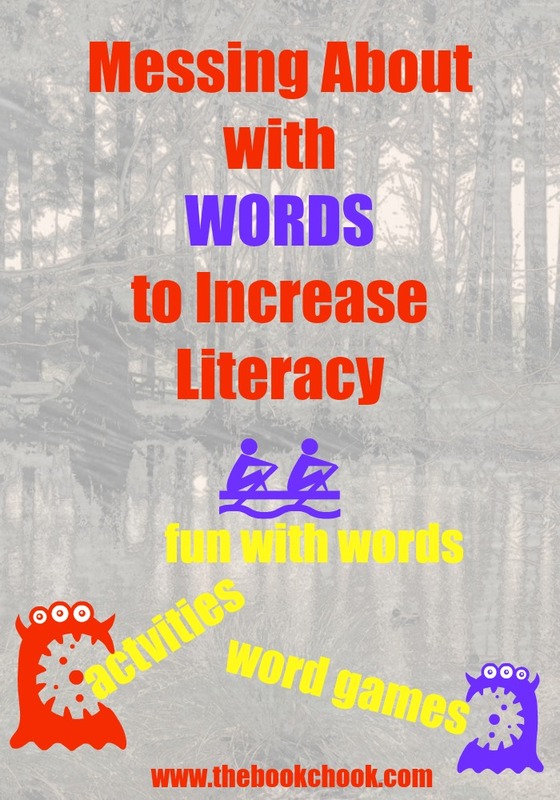 It's an easy strategy to implement that puts the focus on messing about with words, and makes children's functional literacy part of everyday life. Group Writing Games are also a great way to have fun with words. A Book Chook reader and fellow word-lover, Kathy, has recommended these word games: Word Wizard, Suds, and Spellbound. Please make a suggestion in Comments if you have a favourite word game to share.